In my last post, we talked about offline marking strategies, most of which illustrated the importance of having business cards that stand out! A business card should be able to clearly express your brand/blog's purpose & include all the necessary contact information while still retaining visual clarity and aesthetic appeal. Hoda: What is something to always keep in mind while designing your business cards? Haneif: Your audience. That is probably the most important thing, because it has to appeal to them more than anyone else. Although you do want your business cards to be universally appealing, your client is going to be your biggest source of income, so you need your business card to target them. Definitely keep negative space in mind—you don’t want it to look too empty, but it shouldn’t be too crowded either. It needs to be balanced. A business card can easily look unbalanced, fast so it’s important to pay attention to positive and negative space. How would someone be able to tell if the card is unbalanced? Flip your image horizontally and vertically in your image editing software in order to see it as if you’re looking into a mirror—this will give you a new perspective on any image you create. Also, try zooming out until you can’t see individual letters of text and just see black blocks. Squint your eyes and see if it feels balanced. If it doesn’t then move things around or shrink and resize the font or images until it feels balanced. What is the most important component of a business card? Your name and email address. It’s most important because the business card is about you—you are selling yourself, so you want to make sure it’s easy to read and the first thing you see. What is the most common mistake made in designing a business card? The size and placement of your name. It's the most common problem I've seen and it instantly makes thecardlook unprofessional. It's very important to use a font and color that's easy to read but also represents your brand. Any tips for people who have zero graphic design experience? When designing your first business card, start off with only what you need and nothing more. Start with the most important information: name, email address, and blog url. Then add other information that you want to include, one by one until it starts to reach a balance. How about social media? As bloggers we have so much of it to include! That's the thing, you have to decide what social media is most important so you don’t overwhelm your audience. Try to keep it down to your top 3 social media links. And if you’re having trouble deciding, look at which ones reflect where you’re at now—which ones are the most often updated? which do you maintain the most? etc. Any final thoughts or suggestions? Essentially, just start with the basic three things (name, email address, and url), start adding more information little by little until the ratio of positive to negative space is comfortable, then start playing around with the composition and sizing of all of the elements. Hope you enjoyed the interview! 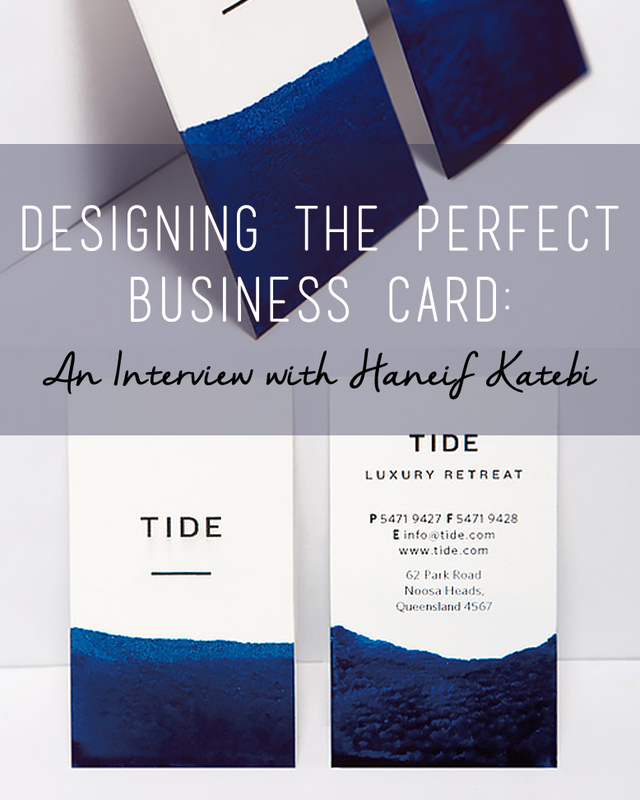 Be sure to stay tuned, as we're also hosting a giveaway to two lucky readers to work with Haneif and design a business card for you that is sure to wow any audience! 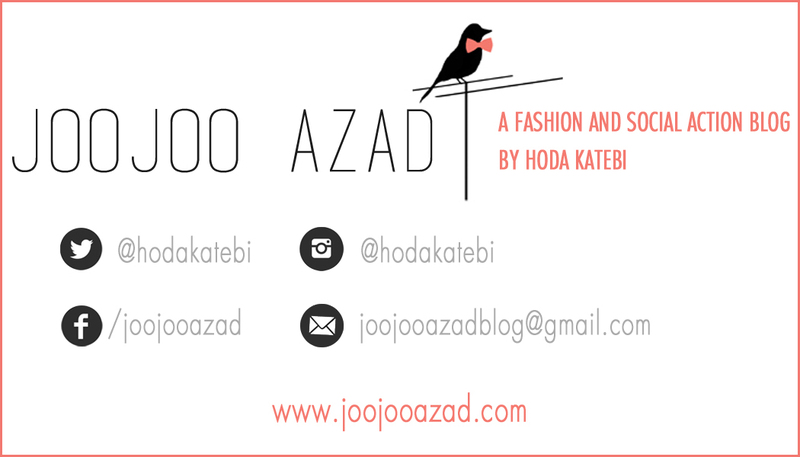 "Blogging Tips" is a new series on JooJoo Azad started due to popular demand and is focused on helping bloggers grow their blogs and speak out on issues that matter to them. New posts are published every Sunday. Hey Hoda, These are really good tips. I love how clean, minimalist and sleek your business card looks yet it is also full of information. It was interesting to get a designer's perspective on business card design. It can be so easy to overload a card with information but maintaining a balance is so important as well. Thanks for this! Hi Hoda! I just spent the better part of the morning reading through your blog posts - wow! What a wealth of information. As a new blogger, I am feverishly taking notes, haha! Thanks for putting so much good stuff on the interwebz! I love your sharing of ethical fashion - something that I think is slowly moving to the forefront of people's minds, it's certainly been on mine lately! this is interesting. First time I hear about positive and negative space and the whole thing of how to make it balance is still a little vague for me... will need to digest it further but it's cool. At least now I know to zoom out to only see dots and squint the eyes, haha!! Oh and thanks for dropping by my blog to leave a comment. I shall put my friend's Olympus to good use.